Venue for "6th World Para-Taekwondo Championships" & "2015 World Taekwondo Grand Prix Series 2"
SAMSUN, Turkey (Sept. 15, 2015) — The Turkish city of Samsun is ready for the 6th WTF World Para-Taekwondo Championships and the 2015 World Taekwondo Grand Prix Series 2. The 6th World Para-Taekwondo Championships will take place on Sept. 17, 2015 and the 2015 World Taekwondo Grand Prix Series 2 on Sept. 18-20, 2015, respectively. 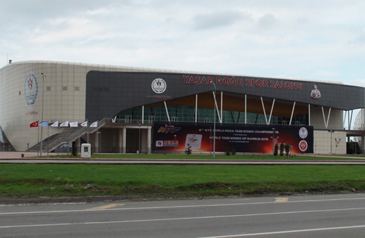 The two events will take place at the Yasur Dogu Sport Arena in Samsun. The one-day World Para-Taekwondo Championships are expected to draw a record 130 athletes, including 14 poomsae contestants, from 38 countries on a registration basis. The previous 5th World Para-Taekwondo Championships, which took place in Moscow, Russia in 2014, attracted 111 athletes from 37 countries. The Samsun championships are the first WTF-promoted para-taekwondo event since the International Paralympic Committee (IPC) voted on January 31, 2015 to include taekwondo on the official program of the 2020 Tokyo Paralympic Games. The IPC granted the WTF a temporary-member status in June this year and is expected to give the WTF a full-member status in November at its general assembly. The Samsun para-taekwondo championships will feature both kyorugi and poomsae events. The para-taekwondo kyorugi (K40) competitions for athletes with a physical impairment is recognized by the International Wheelchair and Amputee Sport Federation (IWAS). The kyorugi competitions will feature three male (-61kg, -75kg and +75kg) and three female (-49kg, -58kg and +58kg) weight categories. The para-taekwondo poomsae (P20) competitions for athletes with an intellectual disability is recognized by the INAS and it marks the second time that the P20 competitions will be held at the para-event. Besides, the Samsun event features for the first time the para-taekwondo poomsae (P30) competitions for athletes with a neurological impairment, which is recognized by the CPISRA, or the Cerebral Palsy International Sport and Recreation Association. Daedo protector and scoring system (PSS) and an instant video replay system will be used for the Samsun para-taekwondo event. Three octagon-shaped courts will be used. Modified competition rules will apply to the championships. Attacks to the head are banned, while punches are allowed, but no points will be given. A valid kick to the body will earn an athlete one point and a valid turning kick to the body three points. The 1st WTF World Para-Taekwondo Championships were held in Baku, Azerbaijan in 2009 with the participation of 38 athletes from 19 countries, compared with 66 athletes from 21 countries at the 2nd championships in St. Petersburg, Russia in 2010. The third championships were held in Santa Cruz, Aruba in 2012 with 53 athletes from 14 countries, while the fourth championships were held in Lausanne, Switzerland in 2013 with 86 athletes from 25 countries. The 5th World Para-Taekwondo Championships were held in Moscow, Russia on June 21-22, 2014 with 111 athletes from 37 countries. Between June 2013 and March 2014, the WTF signed a memorandum of understanding (MOU) with five international para-sport organizations - the INAS, the CPISRA, the ICSD (International Committee of Sports for the Deaf), the IBSA (the International Blind Sports Federation) and the IWAS. At the same venue, the 2015 World Taekwondo Grand Prix Series 2 will take place on September 18-20. The three-day event is expected to draw 234 athletes from 50 countries and 50 international referees will officiate at the Grand Prix event. Three octagon-shaped courts will be used. Daedo PSS and an instant video replay system will be used. Cash prize will be awarded to the top four athletes in each of the four male and four female Olympic weight categories: $5,000 for the gold medalist, $3,000 for the silver medal winner, and $1,000 each for the two bronze-medal winners. The maximum number of athletes per weight category is 32. Top 31 athletes per Olympic weight division based on the August 2015 WTF Olympic world rankings are invited, while one athlete from host Turkey per Olympic division is additionally invited. A country can field up to two athletes per weight category.